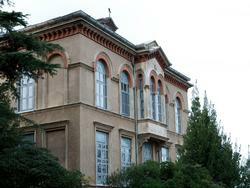 The rehabilitation study for the Theological School of Halki prepared by the Faculty of Engineering of the Aristotle University of Thessaloniki, was presented on May 30 by the faculty’s working group before the Holy Synod of the Ecumenical Patriarchate in Constantinople and the Ecumenical Patriarch Bartholomew. Head of the working group is the Dean, Yiannis Milopoulos. This is a historic moment for AUTH, which undertook the project as a minimum offer to the Ecumenical Patriarchate. According to the university’s announcement, the project paves the way for the reopening of the Theological School of Halki. The professors’ participation was voluntary, while the project’s inelastic expenses were covered by the AUTH Research Committee. The AUTH delegates who made the presentation were professors: George Papakostas, Sassa Lada, Kleio Axarli and Vilma Xastaoglu of the School of Architecture, Ioannis Doudoumis and Christos Ignatakis of the School of Civil Engineering and Thomas Xenos of the School of Electrical and Computer Engineering. The project, Investigation on the rehabilitation methods of the historic building of the Theological School of Halki, was assigned to the AUTH by the Holy Synod of the Ecumenical Patriarchate in October, 2011. The research team consisted of 26 professors and 23 postgraduate students from all the schools of the Faculty of Engineering. The AUTH research team investigated the current state of the building and recorded the necessary repairs and improvements, as well as suggestions for the building’s utilization in such a way that it meets the requirements of a modern academic institution.